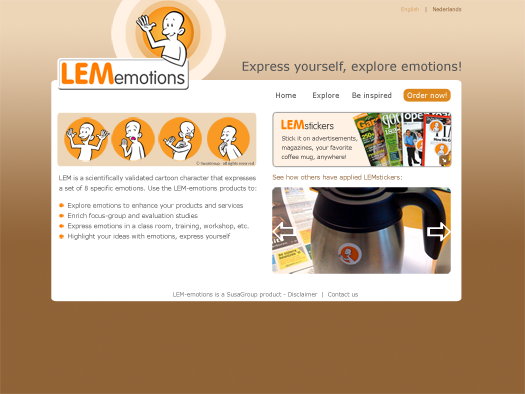 The LEM-emotions is a scientifically validated set of cartoon characters that represents eight specific emotions. You can use the LEM-emotions to answer research questions (explore emotions) and allow people to explain how they feel (express yourself). Currently, only the LEM-stickers are available. SusaGroup will be extending the product portfolio with LEM-clickets (magnets) for on your fridge and whiteboards, and a LEM-game. There are many, many ways you can think of to use the LEM-emotions. Make flipover evaluations in a brainstorm session more fun and effective, gather specific emotional feedback of magazines, use it in one-to-one interviews, enrich focus group sessions, etcetera.